I was talking to my wife a few days ago about the whole "Judgement Day" thing and, although this post is a little late to the game, it's really a chance to express my own thoughts from the past few days. The idea that some man "figured out" the day God is going to fulfill His promise to return to earth for His people, using the same Bible that has verses like Matthew 24:36, is ridiculous. I actually told my wife, it wasn't going to happen, based solely on the fact that he predicted a date and time. 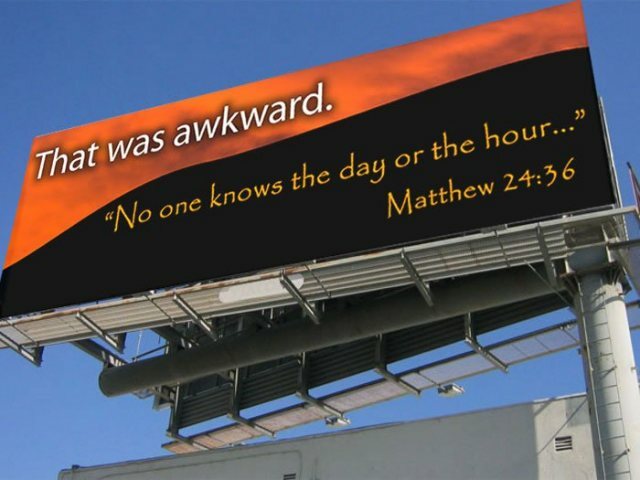 If "...no one knows, not even the angels of heaven, nor the Son, but the Father only," then any time someone says, "Yeah I know when it's going to happen," you can bet it will not be that day. But that's not really my point in writing this post. I did some reflecting on my own life and what a nightmare, joke, sham, ridiculous mess it is, compared to the life the Bible directs a believer to live. After all, our example is the life of Jesus Christ, who was (besides perfect) compassionate, faithful, a servant, a leader, knowledgable of the things of God, a prayer, a studier, a teacher, solely focused on satisfying God's will for His life. Even on the cross, at the point where God was going to turn His back on Jesus and place all our sins on Him He said, "Not my will but Yours be done." And, I'm more realistic to what REAL LIFE is like these days. I mean, the longer I live and the more I experience, the clearer the picture of our desperation and absolute need for God's grace becomes. I never believed a sinless life was possible, but I did think, at one point, I was doing okay. But, more and more I understand the recognition of our depravity is important, and the pain sin causes is required for us to comprehend just how much grace and mercy are crucial for us to spend eternity in Heaven verses Hell. I don't think it is ever going to be possible to feel qualified for Heaven, and if we do, we are probably living a lie, but I am so miserably unhappy with my current Spiritual place, I am becoming more honest with my own "disgustingness" as a creator created by God and realizing my desperation for His grace on either Judgement Day or the day he takes me home. Here comes the BUT in this, for my Christian friends who are thinking I am justifying sin. I know I am still called to live a life that is holy, blameless, and pure. I just think the holy life of a sinful creator proves to be much harder than most Christians pretend it to be. I often think about the Holy Spirit's role here, and wonder if I'm completely ignoring His prompting and cautions for me to avoid sin, or I'm I not able to hear them because my sinful life is the true evidence of a lack of salvation. OH CRAP, that scares me. If I really think about eternal separation from God, it makes me want to puke. I hate my sin. I hate that I am often consumed by it or overpowered by the temptation to be involved in it. And the fact that it seeks me out and draws me into itself is a horror film playing out its plot in my life. So what can I do? I can turn to God, His Word, and His people for support. I can flee from the advances of sin. I can pluck out my eyes or cut off the parts that lead me to sin (Matthew 18:9, 5:29, Mark 9:47). Only, I feel I've done that last one in the past (jail job), and yet I continue to fall back into the same negative disgusting life. Why? Why am I drawn to the very thing I do not want? And why I'm I not running toward the very thing I know I need? God gives us all we need to be successful as His children, but I turn towards selfish gain and self desire instead of purity and holiness found in Him and His word. Granted, there is nothing we can do to earn our salvation, but we are still called to live holy, pure, and without blame. So, there is either Hell or Heaven. One I can achieve on my own, living in the nature of my sin. The other I long for, but can only achieve apart from myself and that nature. One takes no effort. The other takes a life time of selflessness and God's grace. And, although I believe that we all earn Hell, I can not earn the Heaven I so desperately long for. Not without Christ. Not without the sacrifice of God's Son. Not without the WILL of God being such, that He placed all the eternal penalty for my sin onto His blameless Son to bare the price to free me from myself. I am nothing, but I will suffer forever for my nothingness if I don't trust in the Lord with all my heart, and lean not on my own understanding. I am called to acknowledge Him in all my ways, and He will direct my path and make it straight (Proverbs 3:5-6). Oh God, I cry out to You. Renew me, forgive me, oh God. Make me whole in You. Give me joy only Your truth can give. Make me love, like only You can love. Give me peace and patience in this world. Help me trust in you. Direct my path.